In places where both animals live, a distinction is made between the rabbit and the hare. The hare, which generally has longer ears, larger feet and is generally wilder, is typically considered a Trickster. In some cultures, this mythological role is assumed by the clever and mysterious fox. In the Vietnamese version of the 12-animal calendar system, the cat replaces the hare. Common names can be confusing: Bugs Bunny is certainly no bunny, and a "jackrabbit" is not a rabbit. Both are hares. Properly speaking, a baby rabbit is called a bunny. A baby hare is called a leveret. 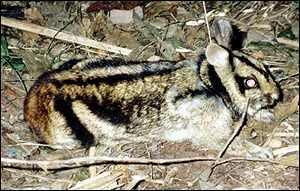 See the rarest rabbit: forest-dwelling, nocturnal, short-eared, striped Sumatran rabbit. In English-speaking lands, we see The Man in the Moon, but it is the image of a hare that is seen by many Asian cultural groups. Hare (or "Rabbit") is the guardian of medicinal herbs that he can convert into an elixir of longevity or even of immortality, which he then stores on the moon. In one of his lives, the Bodhisattva was born in the holy city, Varanasi, as a hare. He had three friends, a monkey, a jackal and an otter. They decided that they would practice the Perfection (Skt. paramita) of Generosity on the up-coming fast day, for it was said that for those who observed the virtues at that time, the merit was greatly multiplied. So, the next day, the otter brought seven red fish that he had found on the banks of the Ganges. The jackal had captured a lizard and pilfered a pot of curd from someone's house. The monkey brought some mangoes. They intended to offer these things to some beggar as act of charity. But the hare, out browsing grass as usual, felt that grass was not a suitable donation, so after some thought, he decided he would offer his own body as an act of charity. Lord Shakra (Indra), king of the gods, got wind of this, and he decided to test the hare's motivation and determination. He disguised himself as a sadhu and went up to Hare to ask for alms. The hare was delighted at the opportunity to practice this ultimate act of Generosity, so he asked the ascetic to pile up some sticks and kindle a fire so that he could roast his own meat as a gift of food. Shakra made a fire appear and the observant hare, not wishing to break the first precept, shook himself three times to ensure that there was no tiny insect in his fur. Then he threw himself on the heap of burning twigs, but nothing happened. So impressed was Lord Indra, that he revealed himself, saying, "Virtuous Hare, your generosity will be famous throughout this entire aeon!" Then with the juice of a mountain, he marked the figure of a hare on the face of the moon where we all can see it to this day and recall the hare's great sacrifice. Jataka 003 at IGNCA. See cave bas-reliefs. Three hares "chasing each other" in an endless circle is a symbol of the lunar cycle has cosmological, mythological and fertility connotations. In the Western classical tradition, it is known as "The Hunt of Venus." At Wikipedia Commons you can see Albrecht Durer's Holy Family with Three Hares (1496) with the hares depicted in full, half and quarter view "proving" the essentially lunar nature of the motif. There the symbolism serves Christian doctrine. The hare can be said to be the preserver of Europe, in that it was due to the appearance of a hare that the Persian army never managed to make significant incursions on the European mainland. According to Herodotus (The History: Book IV, 134) in 513-512 BCE, as Darius was trying to get Scythian horsemen to commit to direct combat in the Persian style, a hare chanced to appear. The Scythians appeared to be more interested in pursuing the animal than in coming forward. Consequently the great Persian conqueror had second thoughts and abandoned his attempt. But good government requires the payment of taxes by its citizens, and the jungle is no exception. The arrangement was that when King Lion had to eat, one animal a day would have to offer itself up as dinner. The turn soon came to Hare. But the more he thought about it, the less he found it a good idea. The sun had almost reached the peak of the heavens, and Hare, reluctant to do his duty, but a good citizen all the same, walked disconsolately through the field towards the King's lair. Just before he reached the shadows of the trees, he noticed a well. He stood up on his fine strong rear legs, looked down into the darkness, and got a wonderful idea. Confidently he quickened his pace, and soon found himself in front of King Lion who was just sitting down to get ready for his dinner. "Your Majesty, began the Hare. "Before you get too sleepy from your sure-to-be very delicious meal of hare meat, I think you should know something. There is a rival in this jungle; another lion who has concealed himself in a deep dark cave until he can take over your kingdom while you are enjoying your post prandial nap. " "Lead me to him, said the Lion confidently. I will get rid of this challenger in no time and be able to enjoy my lunch in peace." The Hare led the lion to the well and stepped aside so that the King could take a look at his rival deep down in the dark, moist 'lair.' When King Lion saw his rival who shook his mane as he himself did, and growled and roared whenever he did, he was so overcome with rage that, without further thought, he threw himself into the well where he drowned. According to Germanic myth, Eostre, the goddess of spring for whom the festival of Easter is named created the first hare out of a fallen bird's body. Ever since, to show its gratitude, the hare has laid eggs during the Easter festival, in her honour. In Spring, the long lean hare seems to go mad with joy at having survived the perils of winter. Its wild behaviour gives us the expression, "Mad as a March hare." In eastern Canada it was recently found that the population levels of the snowshoe hare are what "drives" or determines the numbers of other mammals from the tiny vole to the predatory lynx. Hare: 2 Uigur folk tales. The Cannibal Rabbit, a Cree (Anishnabe) were-rabbit. In folklore, the two are connected by a rivalry. The hare moves with swiftness and agility to out manoeuvre the crafty fox. The pre-bronze age (ca. 5300 BP) body of a man shot by an arrow was found preserved in a glacier of the Ötztaler Alps [Italian Tyrol] bore the tattoo of a fox. The mark may be an indication of a totemic mark that reflects some cultural rivalry. We wonder whether there is more than superficial reasons why in many northern cultures the trickster hero is Fox, while Hare fulfills that role in other parts of the world. Japanese Dakini-ten whose vehicle is the fox. Eostre: the Saxon goddess shares the name of the Jewish heroine, Esther, whose festival of Purim has preceded the Passover ever since it was instituted late in the first millennium BCE. Esther is named for Ishtar (or Astarte) the Great Goddess of the Middle East, who descends to the land of the dead and then resurrects. Eostre's name gives us the term estrogen for the hormone that is essential to females. March hare: Along with the Dormouse and the Mad Hatter, the very giddy March Hare features in the "Mad Tea Party" episode of Alice in Wonderland by Lewis Carroll.